Description: This rare cultivar is an hybrid involving Ariocarpus retususus, Ariocarpus fissuratus and maybe other undefined species and cultivars. Tubercle size and shape vary widely depending on clone, a terminal areole is sometimes present at the tip. The vast amount of phenotypic variation in the species has led to the creatin of several unnecessary cultivars names of no value. 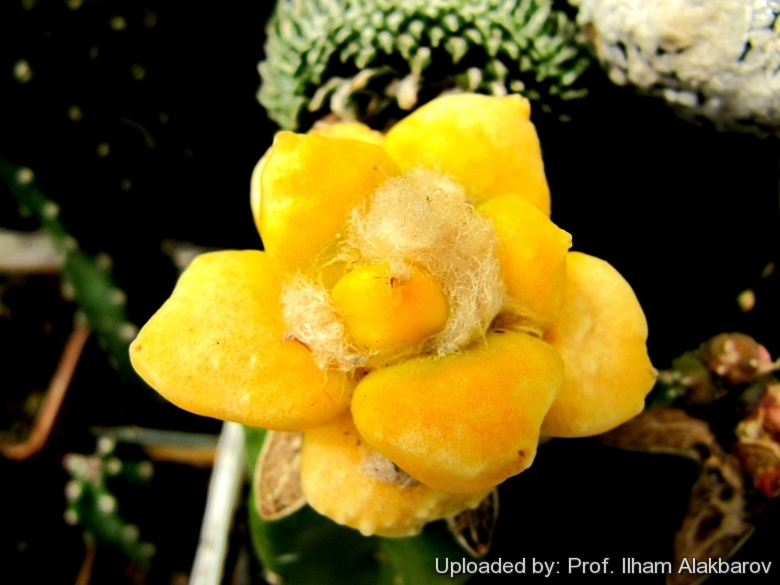 Forma aurea (yellow form): The yellow schizochromic form (Ariocarpus hybrid retusus f. aurea) has bright golden yellow stems due to the absence (or reduced production) of chlorophyll pigments: every other pigment is present at normal levels, the dominant green colouration is lost, but will still more than likely have normal other pigments that give the yellow overall appearance of the stem. This form with yellow stems is very attractive and highly prized. This schizochromic form is almost always seen grafted on stronger columnar species, and cannot can be grown on its own roots. Stem: Solitary, pale to golden yellow or orangish, flattened, globose, rounded on top, 3-12 cm high, 10-25 cm in diameter. Flowers: Diurnal 4-5cm in diameter, 2-4,2 cm long, white to pink , occasionally with reddish midribs.